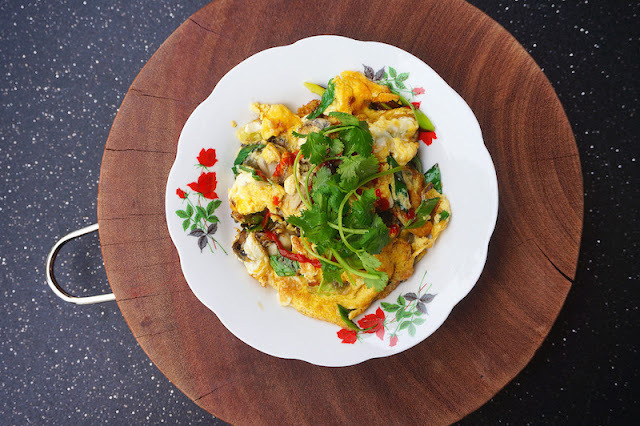 This fried oyster omelette is a very popular dish in South-East Asia. In Malaysia, it is known as "Or/Oh Chien" in Hokkien dialect. There are different versions of cooking this dish, but this one is my favorite. Marinate oyster with sweet potato starch, white pepper, sea salt, & water for 10 to 15 minutes. Heat the wok over high heat. When the wok is hot, add peanut oil. Add in the oyster mixture, swirl, move the mixture around and toss in the leek. Pour the egg over the oyster mixture.